Bright apartment with stylish furniture, with courtyard view. Spacious Living room. The bedroom has a double bed. Bathroom with bath tube. One of the best options available! If you want authentic atmosphere rather than an antiseptic hotel, then this is what we offer. Excellent. Very quiet. Good location. 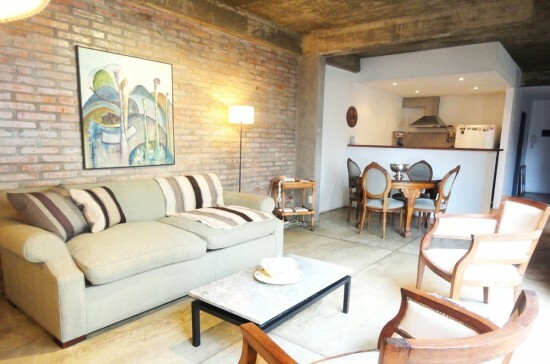 I found this apartment very comfortable to live in and was happy to be there for my ten nights in Buenos Aires. The location is great, the owner of the Apartment very nice and one has everything one needs. I recommend it! We rented this apartment for three months and we were very pleased. The apartment is very clean, quiet and safe. There was everything we needed for cooking. Monica, the owner was always available to answer any question we had and to make recommendations. Also, very well located in San Telmo. We highly recommend this place. Monica's place was as advertised: Great neighborhood, great location, decent size, and well-kept. Monica was helpful throughout my stay. She stayed in touch and was very responsive. Would recommend her studio to anyone traveling to Buenos Aires.